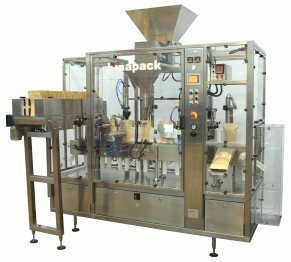 The LINAPACK LFS SERIES machine range for filling and sealing premade stand-up pouches has been designed for the user peace of mind and a hygienic high quality production. These machines are used for a wide variety of products such as food and beverage, animal/pet food, detergents, cosmetics, chemical products, etc. The linear modular design concept offers great flexibility in the type and the number of different products to be filled as well as pouches sizes. The flexibility and quick size change make this machine range suitable for short runs or longer productions even in 3 shifts. The LFS series machines principle is based on a stepping conveyor on which are attached a sequence of function modules. The pouches are naturally standing on the conveyor, maintained in position by quick-change clip-on pucks. Based on this principle, any machine configuration can easily be produced. 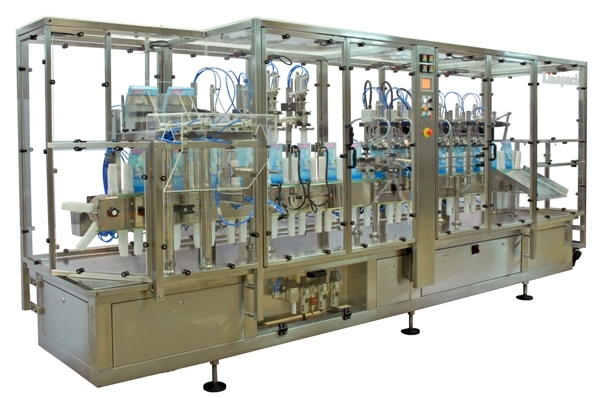 See our dosing units for liquid and dry products. For complex products, special and third party dosing systems can be used. All machine versions can be fitted with accessories to handle pouches with spout, ZIP, valve, special shape, etc. Quick size change over thanks to snap-on tooling (15 to 30 minutes according to the machine model). Completely wash down safe (IP55 or better) thanks to stainless steel and engineering plastics construction including frame, covers and parts. Practically maintenance free and particularly hygienic as no lubrication is needed on the outside machine parts. Accurate and smooth conveyor motion. Complete access granted to all machine parts for quick and easy change over of pouch size and product. User friendly setting done via a touch screen and adjustable while the machine is in production. No pouch or pouch not open - no fill. PID temperature control of sealing jaws. Multiple alarms programmed. The machine stops immediately, at the end of a cycle or after all bags are completed according to the type of alarm. Micro filter for air blown in the pouch at the opening station. Quality and commonly available components are chosen from well reputed international companies. CE or other standard safety covers. Extra long pouch magazine, suitable also for pouches with ZIP or spout. Single or multiple steps filling. Coding by inkjet or embossing. Sealed pouches delivery standing up or lying down on conveyor.